Modern Marine GPS equipment has revolutionized leisure boating by helping to remove the fear and uncertainty inherent in traditional navigation. When I started navigating on my first little boat, way back in the mists of time, the only electronic aids available were both prohibitively expensive and of suspect accuracy on small boats. Navigating at sea was done in the old-fashioned way, by DR chart work, eyeball fixes etc and on the open sea by Sextant, all of which had the potential for large errors the further one traveled. Personally I rather enjoyed the process and calculations involved. However, Marine GPS has now, thankfully removed most of the stress and anxiety from making a land fall, allowing us to plot our position to within an accuracy of ±10 meters. And of course GPS is not affected by the weather, so even in the poorest visibility your GPS will still give you an accurate position. Not only has GPS has improved the efficiency of navigation but it has also improved safety at sea by making it possible to give a precise position to rescuers if, god forbid anything should go wrong. GPS was first developed for the US Department of Defence. The system uses between 24 and 32 satellites, each of which orbits the earth twice every day. The first satellites were launched in 1978, and a second-generation of satellites was launched beginning in 1989 until the system became fully operational in 1995. Each satellite constantly transmits data about its position which the GPS receiver can use to calculate the reciever's position in relation to that satellite. Once the receiver has data from three satellites it can calculate an exact fix of its position in Latitude and Longitude. Add data form a fourth satellite and it can also calculate its altitude. By storing and comparing the incoming data, the receiver can then easily calculate such things as the speed and the course made good, time between positions, estimated arrival time at the next waypoint, heading and a host of other useful information for the navigator. Choosing a Marine GPS Set. Marine GPS systems for the leisure boater come in a variety of setups, from the expensive fully integrated down to relatively cheap and simple handhelds. Global Positioning Systems may have taken the uncertainty out of navigation but don’t throw away your charts. Newer GPS models come out every year, packed with more and more features and they are also becoming more reasonably priced. However, the more time you spend playing with these toys and the more you come to rely on them, the less will be your connection to the environment you are out there to enjoy. My own personal preference is for something that is simple, easy to tread and above all easy to understand and set up. Screen size should be considered when purchasing your next marine GPS unit. The screen might be easily read in the shop but will it be legible in poor light, at sea, when your eyes are tired? A touch-screen that makes entering numbers and addresses easier might not be so effective when your hands are wet and stiff with cold. The ability to enter 1,000 waypoints sounds impressive, but has anyone ever sat down and entered that many? And how do they keep track of them all? The range of alarm functions such as ‘Off Course’, ‘Shallow Water’, and ‘Anchor Drag’ can be a big help but there is no way I would want a disemboweled voice constantly butting in. Improvements to versatility and design continue to rise at an alarming speed and Bluetooth, phones and other devices are incorporating GPS. So, when deciding which Marine GPS set to buy you will need to be sure what you are comfortable with. If you are not into gadgetry and just want to enjoy boating, don’t let the sales talk persuade you into buying something too complicated. Keep it simple, keep it rugged, and keep it cheap enough to be able to afford a spare as back up. Setting up the newer marine GPS units is becoming less of a chore than it used to be. However, operating manuals do still tend to appear to be written by geeks and often they are over complicated, with confusing instructions on some of the bells and whistles, which are rarely if ever going to be used. Your set needs to be set to the same horizontal datum showing on your nautical charts. And the vertical datum should be coordinated with your charts and depth sounder. You may also need to feed in the height of your antenna above sea level. Whether your charts show the depth in feet or meters, having everything set to the same reference will avoid confusion. Using the proper horizontal datum will improve the accuracy of the data provided by your GPS. Most modern charts use either the ’NADB3’ datum (North America) or the ‘W0S84’ datum (World Geodetic Survey). Set your GPS to the one you most commonly use, some minor corrections may be necessary when plotting on the other chart datum, however, providing the charts are modern ones, this correction is very small. Beware, on older charts the difference can be quite large depending on your location. The latitude and longitude position shift can be as much as 500 yards/meters, quite a lot if you are trying to find a narrow passage in fog. The best bet for anyone using GPS is to replace all those old charts with modern up to date versions. 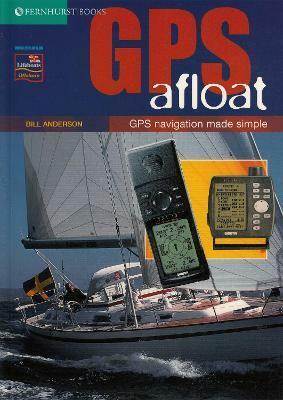 Nowadays it is rare to find any boater who doesn’t have a marine GPS on board. 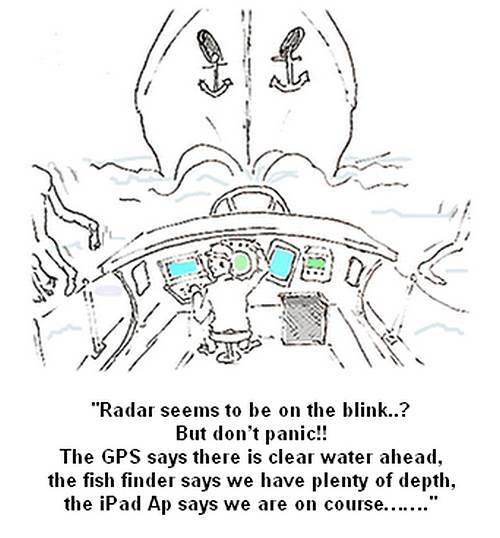 However, it shouldn’t be assumed that using a marine GPS is the answer to all your navigation problems. But then the same could be said about the echo sounder, which is a must have on boats these days. Yet, in my home sailing area there is often a lot of silt being stirred up by the tidal stream, which often fools the depth sounder. And an echo sounder won’t show you nature of the seabed the way the piece of tallow in the bottom of an old fashioned lead could. However, they are both such great aids to navigation it would be foolish to ignore them but they should not be relied upon entirely. To use your GPS effectively you should learn about the system’s limitations and how to make simple checks to ensure the GPS information is not leading you into danger. It should always be used with reference to an up-to-date nautical paper chart. 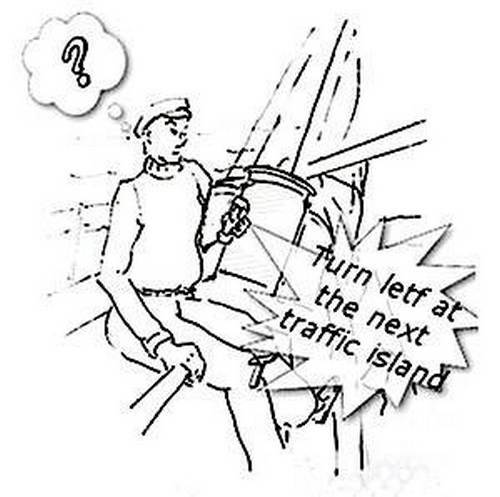 Accidents still occur where a boat’s crew have blindly followed their GPS instructions with out regard for or understanding of the limitations or because of faulty input of information. In practice the main danger in using Marine GPS to navigate, is normally caused by operator error. It should always be backed up with a set of checks making use of paper charts your compass and your senses. As with any navigational error they are especially dangerous when close to shore. At sea it always pays to be just a bit sceptical. Fortunately, as sets become more robust, it is becoming increasingly unlikely to ever find ourselves in a situation where the marine GPS has suffered an electronic failure. And I sincerely hope that the system never has to be again shut down for military operations, as it was during the Kosovo and Iraqi conflicts.